Keeping Your Employees Happy, Keeps Your Guests Coming Back! To be successful in the hospitality industry it is the responsibility of management to have policies and practices in place to remain both relevant and achieve sustained profits. One important area of is that of employee satisfaction, which has a direct effect on your customer experience and in turn their loyalty to your establishment. One of the key components in the hospitality industry to customer satisfaction is superior quality of service. If your employees are not happy they often lack the motivation needed to provide superior service, which then results in less than happy customers. You will see this affect your revenue as the soured employee’s attitude trickles down to the customers they interact with daily. Happy employees produce happy customers. In today’s technology reliant world your customers are able to access online review sites and instantly research their travel options. These reviews can contribute to the decision to stay at your hotel or a competitor’s, and one review could cost you customers. The best and most effective weapon in your arsenal is your employee’s engagement with the customer. 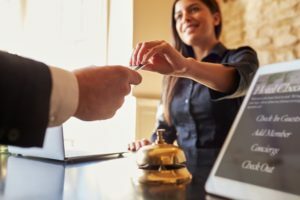 Getting your employees to become connected to the process is the initial step in creating a long-term relationship between the hotel and its guests. Your guests want authentically engaged employees that have genuine concern for their satisfaction. Your employees should fully understand and be in line with your brand and values they will be representing daily. One way to get your employees to be authentically engaged is open communication, a safe environment for your employees to discuss openly what is working and what might not be working. You need to have managers in place that can react to those ideas and make necessary adjustments to improve the employee environment. Your employee becomes invested in the delivery of the brand and will result in better overall customer satisfaction. Your employees are the face of your business and there is no debating that the employee attitude, productivity and band knowledge directly affect your guests’ satisfaction and managers need to focus on the employee-guest relationship. Your happy customer base is the key to security and longevity in the hospitality industry. In the travel industry customers often base their spending behavior of the perception of service. An honest, welcoming, reliable & friendly staff in conjunction with quick and efficient check-ins will create an environment for profitability. For as long as there is an interest and need for travel (which is forever right?) the hospitality industry will continue to thrive. To grow, the hoteliers need to keep their employees engaged, motivated and content.